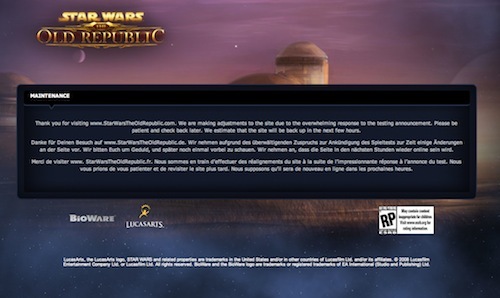 All you can do wait for the site to return and to wonder at the infrastructure challenges facing BioWare when SWTOR actually goes live. Here’s hoping they’ve purchased a small country somewhere in which to house the servers required to run things when everyone logs in at the same time. Anyway, here’s where you need to go to sign up for the beta program, just expect an image similar to above in the short term.